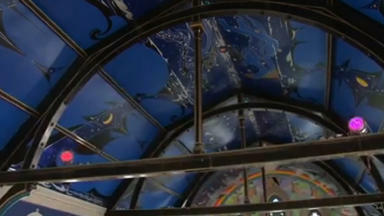 Alasdair Gray reveals a tile mural to celebrate the aquatic history of the Western Baths in Glasgow's West End. The latest work from Glasgow artist Alasdair Gray – a mural at the Western Baths Club – is definitely invigorating. The work, which marks the end of Alasdair’s two-year term as artist in residence at the Victorian swimming baths, was being unveiled to members on Friday (April 5). Ahead of the launch, the 78-year-old artist who never learned to swim, typically underplayed the significance of his work by scoffing: "I’m too old to be excited. 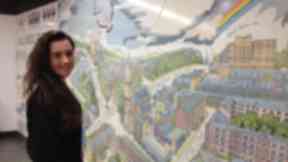 He collaborated with fellow artist Nichol Wheatley to produce the pioneering piece of tile work. Alasdair said: "I was offered a free membership of these Baths by Bill Mann in return for being the artist in residence. I then thought, what can an artist in residence do? "I thought that since I designed a mural in tiles for a wall in the Hillhead underground and since my friend Nichol Wheatley - who had helped me turn my designs into tiles - was a member of this bath club too, I thought that he and I could put a design down that would be suitable." 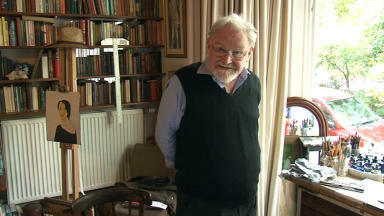 Watch our video: Alasdair Gray mural at Hillhead subway station unveiled to the public. The £10,000 work of art was commissioned by honorary secretary of the Western Baths, Bill Mann. Bill, who saved the facility from closure in the 1970s, gave his artist in residence a ‘broad, wide open brief’ and after a year and a half of designing Alasdair delivered another mural masterpiece. 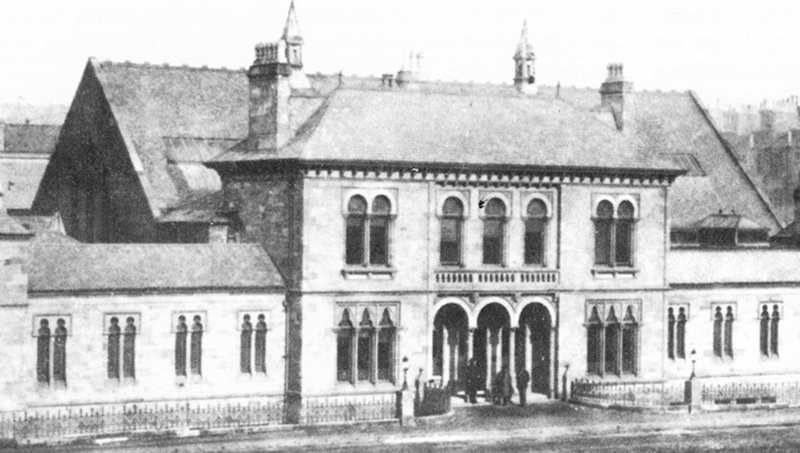 The Western Baths Club on Cranworth Street dates back to 1876. Alasdair and Nichol spent many hours in the Baths steam room talking about art, history and discussing the task at hand. 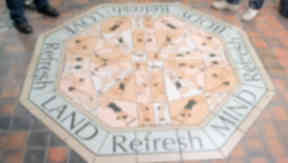 Nichol recalled: "Alasdair turned round and said, 'I’d like to make a tile work' – we were deep into making the Hillhead Subway work at the time – and he wanted to make his message within that while reflecting the ethos of the Baths. "The Western Baths is owned by all the members, they are a very traditional club – all the members own a stake. "At the same time, Alasdair wanted to look at how we look at ourselves, hence the message 'Refresh Mind, Refresh Body, Refresh Land and Refresh Love'." For Nichol, who owns the company Perfect Circle Art in Maryhill, the piece is "very Alasdair Gray". He said: "He’s such an individual, he really does make his own stuff and you can see that. "Alasdair is such a polymath, somebody who is so talented at all these different things and he looks back at history really clearly to take inspiration which then forms his work. "He’s got this beautiful ability to draw and this beautiful ability to look for that line again and again and again until he gets it." Pointing to the mural on the floor, Nichol breathes: "And there it is. I love it." Nichol developed the pioneering process which allowed Alasdair’s designs to be transferred onto tiles. "Nobody had been stupid enough to try this before, Alasdair and I found that out when we were working on the Hillhead Subway," he explained. "We’re using porcelain because of its qualities – strong, durable, beautiful product. "The traditional method is that you can fire onglaze transfers into the glaze of a ceramic tile but historically you couldn’t fire onglaze tranfers onto porcelain because there is no glaze on porcelain, it is just clay. "So we figured out a way to do it. Alasdair went through something like three or four hundred tiles before he chose this combination of tiles." His final striking selection has left members stunned. Bill praised Alasdair Gray’s artwork saying it was a "wonderful interpretation" of the spirit of the club. 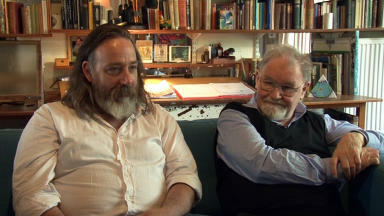 He said: "We are especially grateful to Alasdair Gray for his design. "It is traditional for artists in residence at the Baths to leave a legacy of their tenure. "Rather than a portrait or landscape painting, we were delighted with the idea of having a tile floor transformed with this innovative and striking art work."